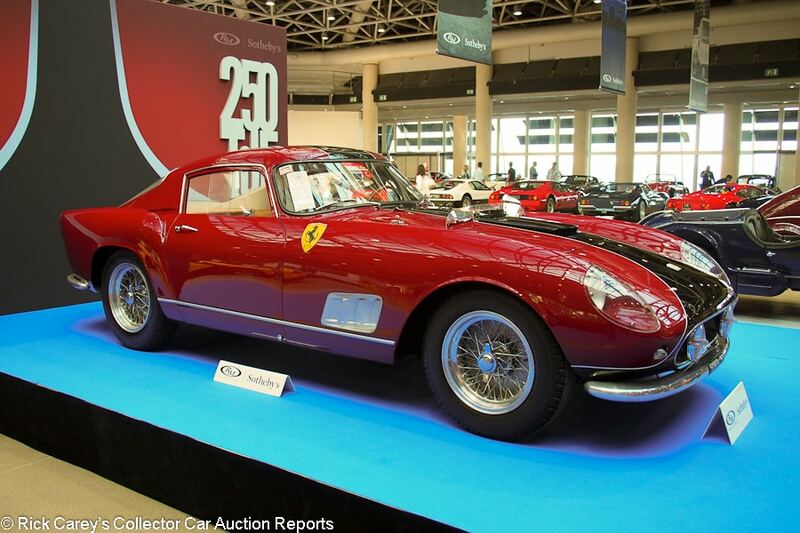 RM Sotheby’s biennial visit to Monaco during the GP Historique turned in creditable numbers despite missing on the headline $7 million Ferrari 250 GT Tour de France. RM’s Monaco history has been erratic, sometimes featuring a large consignment of moderately priced cars such as 2016’s Quattroroute Collection and sometimes including a big buck consignment such as 2014’s Ferrari 275 GTB/C that sold for $7,861,426. Further complicating the comparisons are fluctuating exchange rates which have varied substantially over the years, and even month-to-month. The Euro exchange rate just three months ago at Rétromobile was $1.2281.That three cents/Euro is a 2.8% difference, but nowhere near as much as the $1.3763 of four years ago. Also significant are commissions which this year were 15% of the first €200,000 and 12.5% above that. Two years ago the buyer’s commission was a flat 12%. 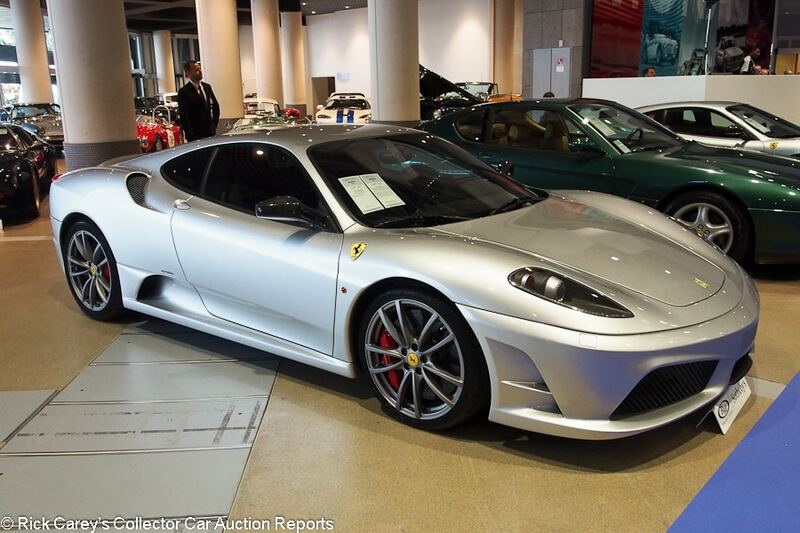 Twenty-five of the 86 lots at Monaco this year were Ferraris, 29% of the entire sale. Fourteen of the consignments were Porsches, sixteen if including the two RUFs. They accounted for forty-one entries, 47.7% of the whole sale. Lot #161 2018 Lamborghini Huracan with proceeds to charities selected by Pope Francis and very subtly autographed by the Pope on the bonnet initiated the day’s most fierce bidding contest, eventually ending up at a generous $967,284. 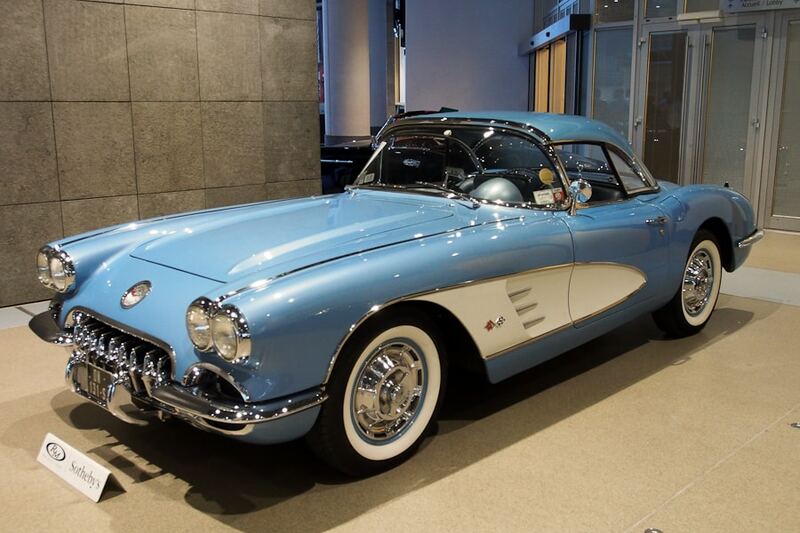 Lot # 114 1960 Chevrolet Corvette Convertible; S/N 00867S105903; Engine # 105903 F211CU; Horizon Blue, White coves, Horizon Blue hardtop/Ice Blue vinyl; White vinyl top; Estimate $107,559 – $143,412; Older restoration, 2- condition; With Reserve; Hammered Sold at $346,579 plus commission of 14.22%; Final Price $395,877. – 283/270hp dual quads, 4-speed, WonderBar radio, spinner wheel covers, wide whitewalls, two tops. – Represented as the original engine, NCRS Top Flight in 2009. Very good older paint, chrome and interior. The cove spears’ chrome is starting to flake. Gauges are still clear and crisp. Left front bumper chrome is starting to lift. No longer Top Flight but still very good. – RM sold this car here in Monaco in 2014 for $184,975, a thoroughly astounding price at the time and this is more than twice as much. It is an understatement to say it is crazy money in 2018, a price that shows the bidders had completely taken leave of their senses with a result that is easily three times what it’s worth on its best day ever. This is an aberration and an opportunistic merchant would already be filling containers with old NCRS Top Flight straight-axle Corvettes to send to Europe to catch the euphoria. 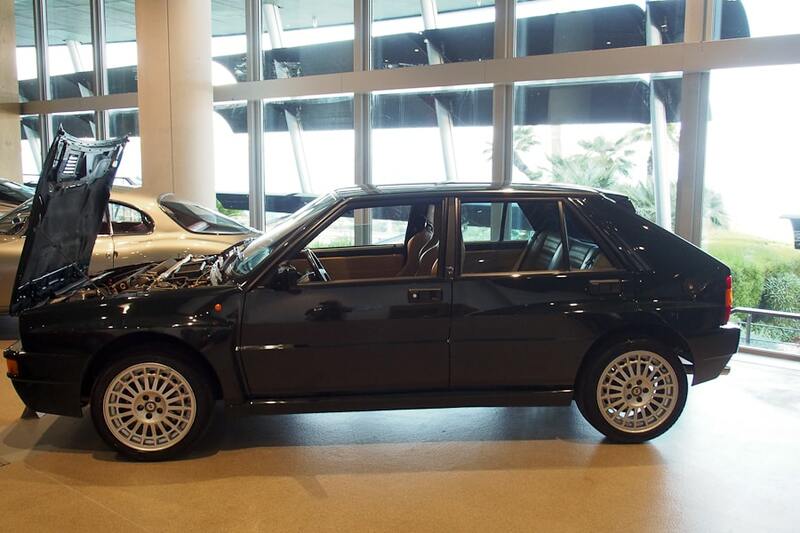 Lot # 115 1992 Lancia Delta HF Integrale Evoluzione ‘Verde York’ 4-Dr. Sedan; S/N ZLA831AB000576497; Dark Green/Parchment leather; Estimate $107,559 – $155,363; Unrestored original, 2- condition; With Reserve; Not sold at Hammer bid of $83,657. – 5-speed, air conditioning, alloy wheels. – One of 200 16-valve 210hp Delta HFs without catalytic converters. Freshly serviced including a new clutch and suspension bushings. 11,192km showing and the car looks like that’s all it’s covered as well as being represented as since new. The paint is lightly scuffed and the seats are lightly stretched. 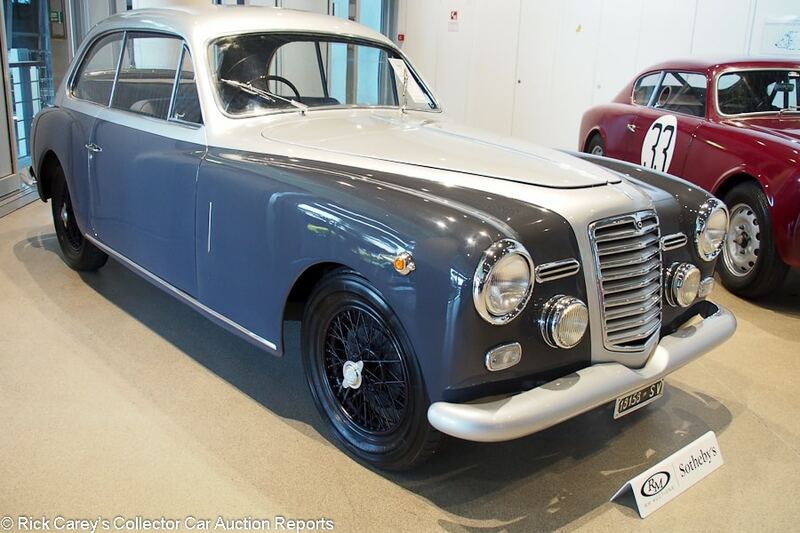 – A bit better pre-sale cosmetic attention would have added immensely to the presentation of this Lancia and substantiated the reported thorough recent €12,000 service. As it is it looks old, which is not encouraging, and the bidders were reluctant to chase it. 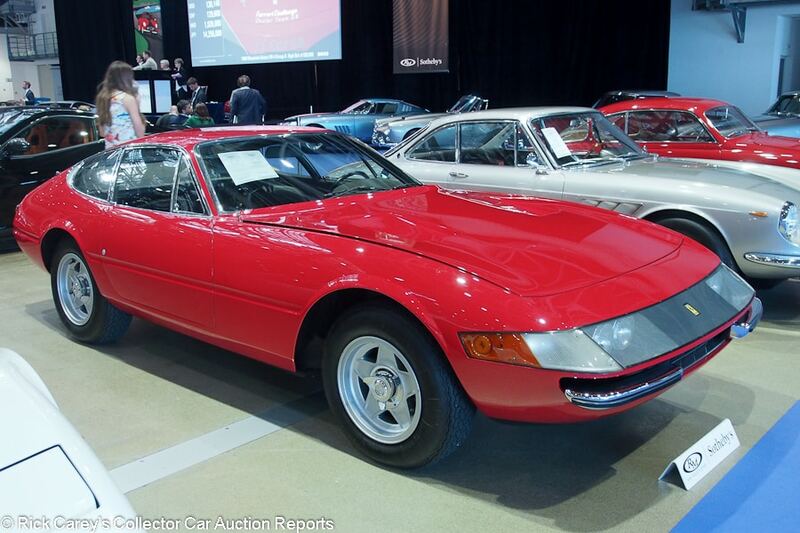 Lot # 116 1970 Ferrari 365 GTB/4 Daytona Berlinetta; S/N 13183; Red/Black leather; Estimate $657,305 – $776,815; Older restoration, 2- condition; With Reserve; Not sold at Hammer bid of $585,599 – Ansa exhaust, Cromodora centerlock wheels, Michelin XWX tires, Momo leather-wrapped steering wheel, power windows, Veglia air conditioning, Becker Mexico stereo, Plexiglas nose. – Represented as the original engine and gearbox. Spotless engine bay and underbody. Lightly worn seats. An older restoration that’s been recently refreshed and has no needs of any consequence. 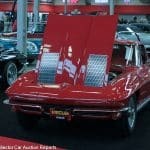 – Offered by RM in Arizona last year where it was bid to $600,000, this Daytona is chasing a soft market into oblivion. It could have sold at this bid with some regret, but now will yet again be recycled in the marketplace. 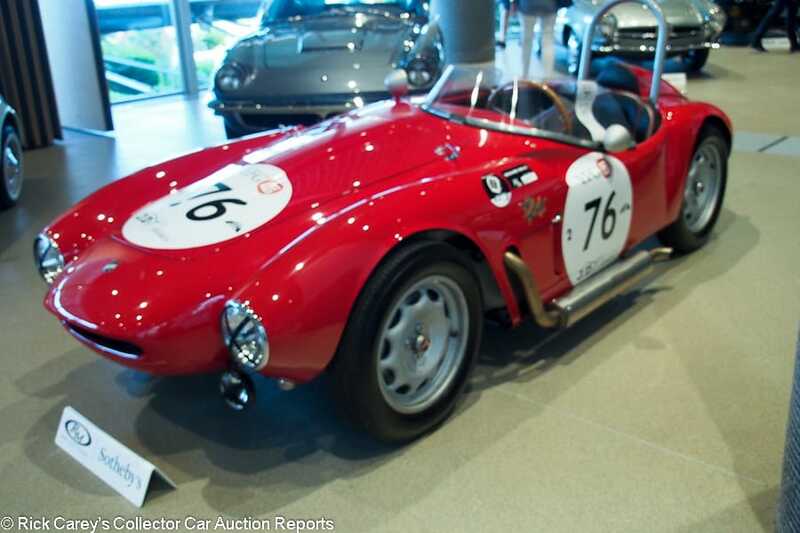 Lot # 118 1955 Moretti 750 Gran Sport Barchetta; S/N 1612; Red/Black vinyl; Estimate $239,020 – $298,775; Competition restoration, 2 condition; With Reserve; Not sold at Hammer bid of $173,290. – 748cc/71hp, 4-speed, stainless steel side exhaust, driver’s rollbar, covered passenger seat, wraparound Plexiglas windscreen, alloy wheels, Dunlop Racing tires, driving lights, driver’s head fairing, modern instruments (originals included). – Very good paint and interior, good bright trim. Engine compartment, frame and chassis are like new. Le Mans Classic 2014 and 2016, Mille Miglia 2013 participant. Shown at Pebble Beach in 2002. No racing history in-period. A charming and exhilarating diminutive racer for a jockey-weight driver. – Such a rare car is hard to value, but this result is comparable with similar Morettis and could have been taken with only limited regret. 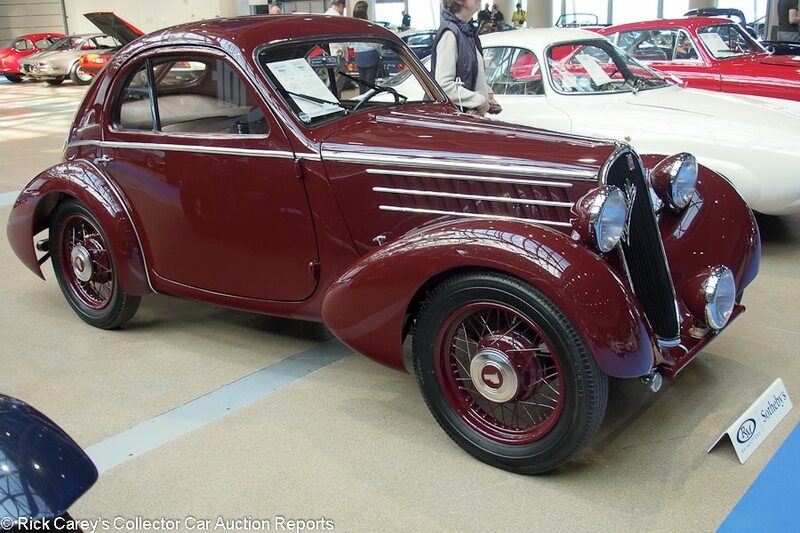 Lot # 120 1935 Fiat 508 CS ‘Balilla’ Berlinetta Aerodinamica; S/N 508S076019; Dark Red/Beige cloth; Estimate $472,065 – $591,575; Recent restoration, 2 condition; With Reserve; Hammered Sold at $400,359 plus commission of 13.99%; Final Price $456,379. – Halda Twinmaster rally odometer, modern gauges, driving light, body color wire wheels, Dunlop tires. – 1936 Mille Miglia participant with Alberto Comirato and Lia Dumas, finishing 2nd in class and 14th overall. One of only eleven known with this coachwork. Mille Miglia 2016 participant with subsequent cosmetic restoration. Very good paint, chrome and interior that are blemish-free. The engine and underbody have been restored like new and show scant use and only a little age. Original documentation supports the period Mille Miglia participation. – All that, and it’s a pretty little car, too, like an 8/10 scale Alfa with teardrop fenders and a deliciously sculpted profile. The presentation is exceptional, more than good enough to show and a standout on the road. It isn’t cheap, but it’s worth every Euro of the handsome price it brought for its condition, history and style. Lot # 123 2008 Ferrari 430 Scuderia Berlinetta; S/N ZFFKZ64B000163729; Silver/Black Alcantara, cloth inverts; Estimate $239,020 – $286,824; Unrestored original, 2 condition; With Reserve; Not sold at Hammer bid of $209,143. – Carbon fiber mirrors and interior trim, Matte Grey 5-lug alloy wheels, Red calipers, SF shields, radio delete. – 1.833 km and like new. Serviced in February including new tires. – Sold by RM at the Duemila Route auction in November 2016 for $219,528 (€207,200 at the time.) Its bland appearance does little for its appeal. Duemila Route was an event that exceeded expectations, sometimes by large margins, and this was only modestly bid over its €175,000 high estimate at €185,000 hammer but even that small (by Duemila Route standards) premium left it sucking for air at Monaco in 2018. Lot # 125 1984 Ferrari 512 BBi Berlinetta; S/N ZFFJA09B000049533; Red/Beige leather; Estimate $268,898 – $328,653; Visually maintained, largely original, 3+ condition; No Reserve; Hammered Sold at $191,216 plus commission of 15.00%; Final Price $219,898. – Centerlock 5-spoke alloy wheels, TRX tires, Borletti air conditioning, Pioneer cassette stereo, power windows. – Good repaint and lightly creased original interior. Beat up black roof trim. Clean underbody and engine compartment, but not like new. Represented as 11,641 miles from new, cam belt serviced … in 2014, four years ago. – That was when it was sold by RM in London in 2014 for $307,325 (€237,400 at the time, this result is €184,000 all-in.) This is an old and unattractive BBi that has had scant attention in years and is fully valued at this result. The seller should be grateful for such a small loss in the face of scant attention. This is a better photo from Paris in 2017. 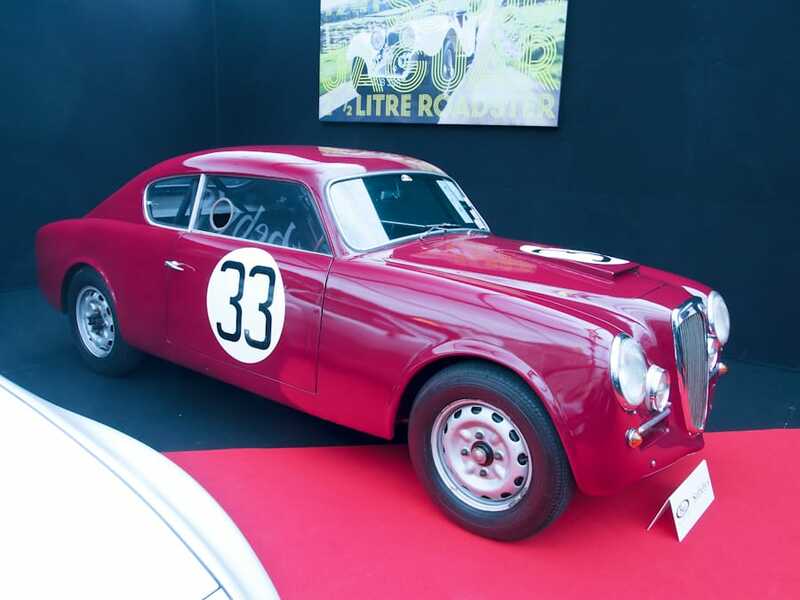 Lot # 128 1952 Lancia Aurelia B20 GT SII Coupe, Body by Pinin Farina; S/N B201824; Dark Red/Black vinyl; Estimate $143,412 – $179,265; Modified for competition during restoration 4 condition; No Reserve; Hammered Sold at $83,657 plus commission of 15.00%; Final Price $96,206. – Braced rollbar, 4-point belts. – Later 2,451cc/118hp engine, disc brakes. Vintage raced in the UK in the 70’s. Horrible old repaint over visible sanding scratches, overspray everywhere. Sound upholstery on bucket style seats. Silver painted window trim. Scrofulous. – Despite selling at RM’s Monaco auction in 2010 for $134,085 and Paris in 2017 for $149,912, RM notes that VAT (20%) is due on the full purchase price and commission bringing the total out of pocket to $115,447, likely accounting for the modest result it saw here, not to mention the effect of its despicable condition. This is a nasty ride not getting better with age. 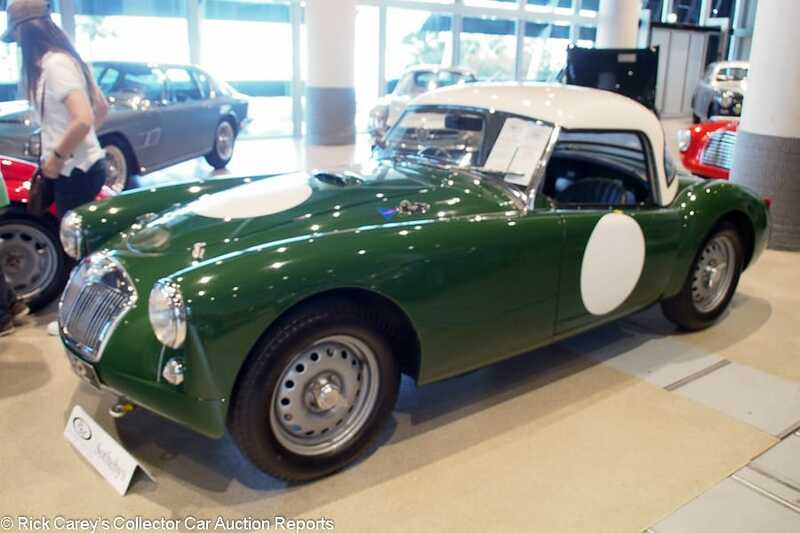 Lot # 129 1959 MG MGA Twin-Cam Roadster; S/N YD11626; Engine # 1668UH1246; Dark Green, Ivory hardtop/Dark Green leather; No top; Estimate $107,559 – $143,412; Competition car, original as-raced, 3 condition; No Reserve; Hammered Sold at $44,816 plus commission of 15.00%; Final Price $51,539. – RHD. Hardtop only, centerlock wheels, Dunlop Racing tires, trunk lid quick release fuel cap, leather wrapped steering wheel rim, Smiths chronometric tach, 45DCOE Webers. – MG Competition Department prepared when new. Later raced in South Africa. Replacement engine. Scuffed, chipped old repaint. Sound older replaced upholstery. Repainted but otherwise original chassis. Reasonably clean and orderly engine compartment. Small dimple in the left rear fender. – An intriguing Twin Cam with an obscure early competition history and engine changes. The result here is an intelligent compromise of its history, condition and equipment and the new owner should be satisfied both with the car and with its price. 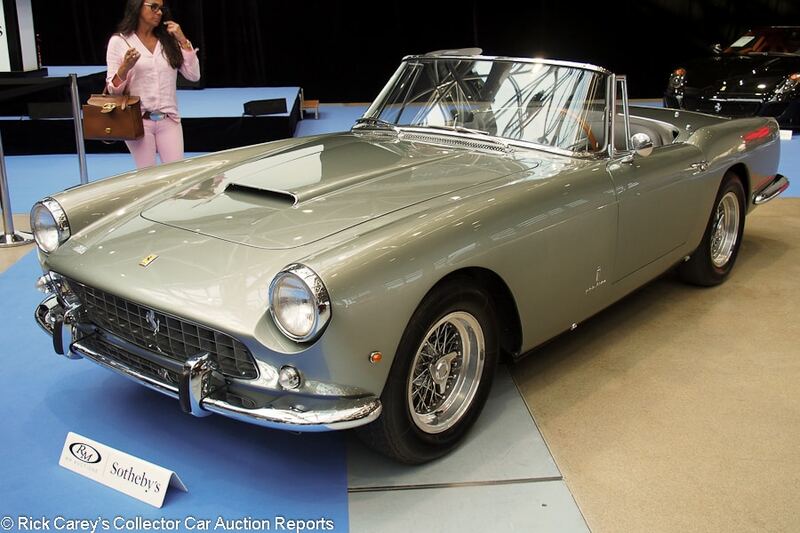 Lot # 136 1962 Ferrari 250 GT Cabriolet Series II, Body by Pininfarina; S/N 3459GT; Engine # 3459 (146/52E); Grigio Conchiglia/Black leather; Black cloth top; Estimate $1,673,140 – $1,912,160; Recent restoration, 2 condition; With Reserve; Hammered Sold at $1,792,650 plus commission of 12.83%; Final Price $2,022,707. – Chrome spoke Borrani wire wheels, Michelin XWX tires, black wrinkle painted dashtop. – Beautiful paint, chrome and interior, crisp gauges. The engine compartment and underbody are like new. Ferrari Classiche certified with its original engine and gearbox, although not its original colors. A handsome and reassuring car in impeccable condition. – This is an exceptional price for a SII Cab, but this is an exceptional example that should, and did, set a standard for the model in condition, presentation and value. 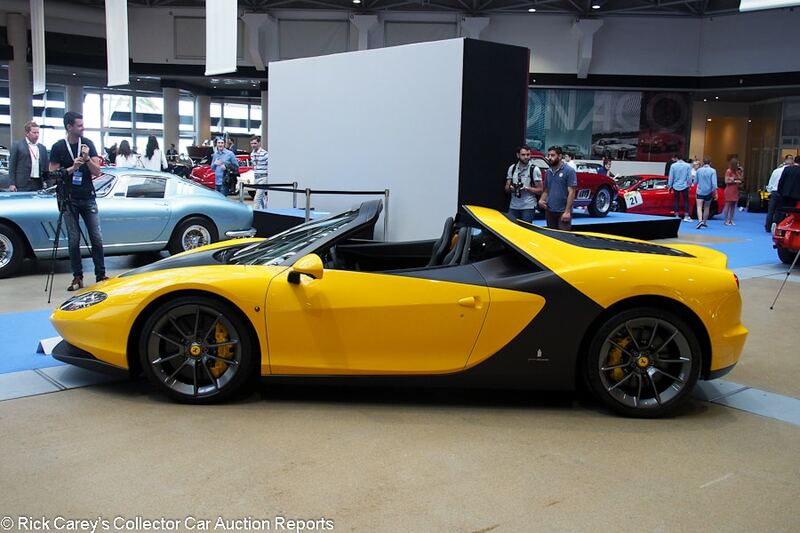 Lot # 145 2015 Ferrari Sergio Barchetta, Body by Pininfarina; S/N ZFF75VHB000205529; Yellow, Matte Black/Black leather, Alcantara; Estimate $2,987,750 – $3,585,300; Unrestored original, 2+ condition; With Reserve; Not sold at Hammer bid of $2,629,220. 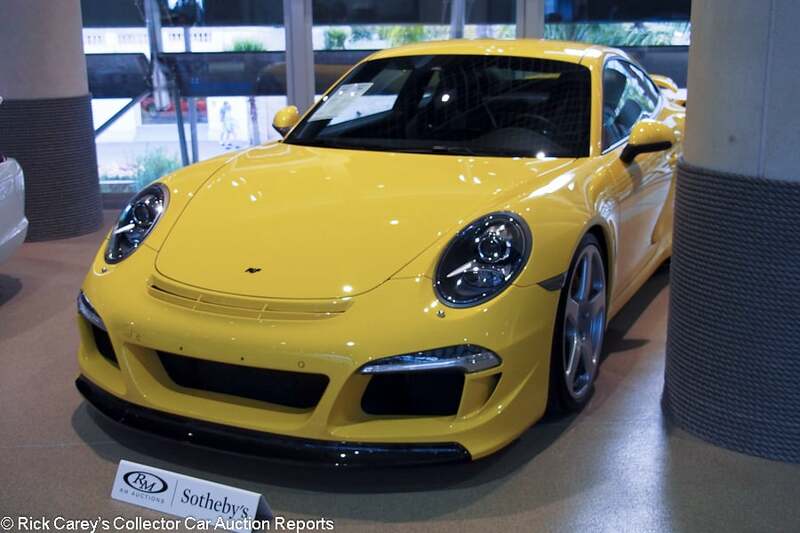 – Dark Grey 5-bolt alloy wheels, Michelin tires, Yellow calipers. – 458 Spider chassis and Speciale drivetrain, one of six examples of the 2013 Geneva Motor Show car, displayed at Geneva in 2015. 118km and like new. – Considered to be a new car with 20% VAT due on the full purchase price including commission, had it been sold it would have cost nearly $3 million to put on the road in the EU which makes the bid here reasonable, but also the consignor’s decision to keep it in a quest for a Ferrari collector looking for a seriously special car. 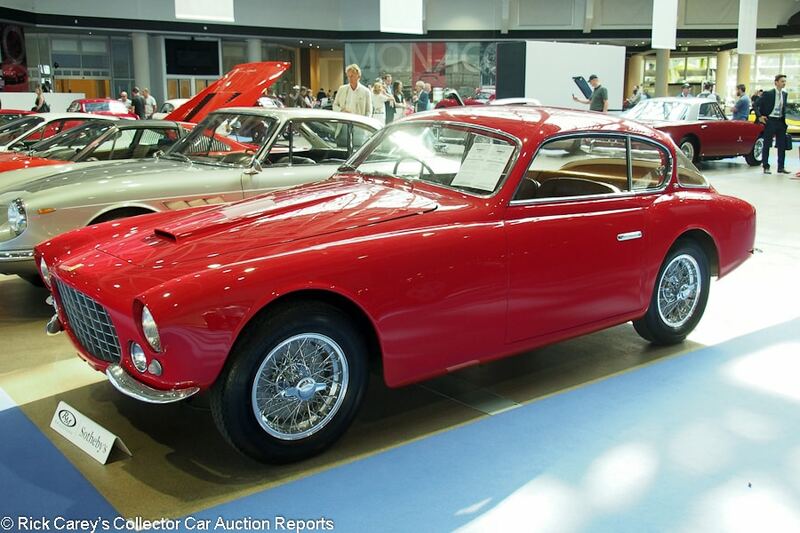 Lot # 146 1950 Ferrari 195 Inter Coupe, Body by Ghia; S/N 0113S; Engine # 0113S; Red/Brown leather; Estimate $597,550 – $717,060; Cosmetic restoration, 3 condition; No Reserve; Hammered Sold at $621,452 plus commission of 13.46%; Final Price $705,109. – RHD. 1995/150hp, triple Webers, 5-speed, chrome spoke Borrani wire wheels, Vredestein tires. – Represented as the original engine, gearbox, differential, steering box and carburetors. Good paint but with blisters in the door bottoms, chips around the hood opening and shrinkage on the right front fender. Sound older interior. Weak trim chrome. The engine compartment is orderly but superficially repainted and aged. A driver quality early Ferrari with modified body lines front and rear. – Sold by RM in London in 2011 for $445,340 in essentially the same condition as it appears today, the result here reflects its rare (but bulbous) Ghia coachwork and its eligibility for a variety of events restricted to early cars like this. 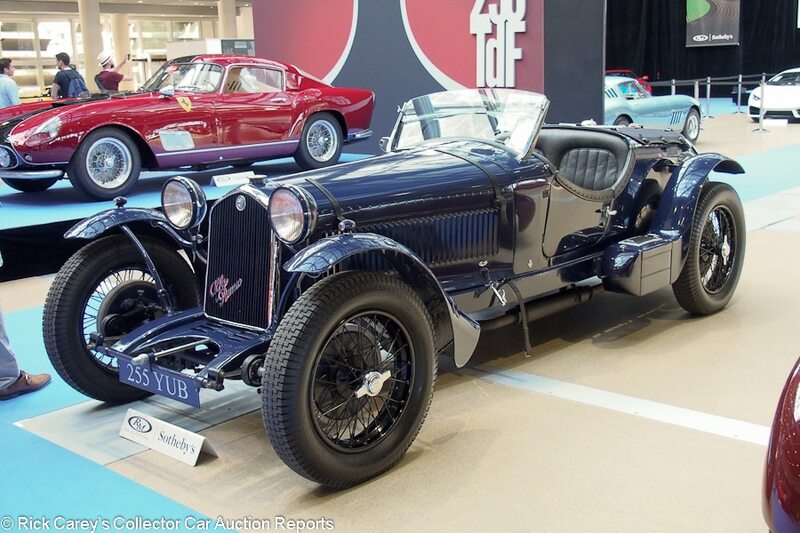 Lot # 147 1933 Alfa Romeo 6C 1900 Gran Turismo Spider; S/N 121315124; Engine # 121315124; Dark Blue/Black leather; Estimate $597,550 – $717,060; Rebodied or re-created, 3+ condition; With Reserve; Hammered Sold at $549,746 plus commission of 13.59%; Final Price $624,440. – RHD. Black wire wheels, Dunlop tires, cycle fenders, full windshield, beetle-back tail, Bosch headlights. – Sound but dull old paint, good interior with some wear. Orderly but oily engine. Rebodied from the original Touring saloon by Neil Twyman including bonnet and cowl and enjoyed since. Represented as the original engine, chassis and drivetrain, supercharger added later – Export license required if removed from the European Union. Not what it appears or wants to be but more than enough to excite any Alficionado and a great tour car for not a lot of money, especially considering what has been spent to make it into this vision of a classic 6C Alfa. 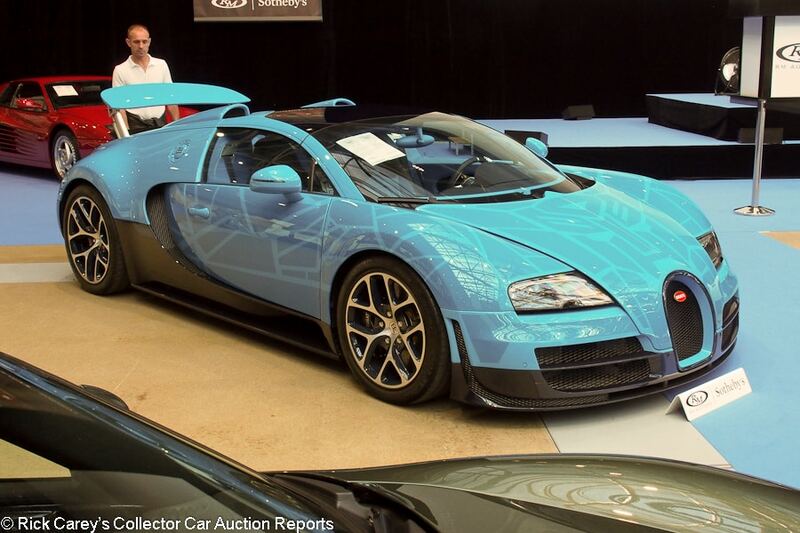 Lot # 148 2015 Bugatti Veyron 16.4 Grand Sport Vitesse; S/N VF9SV25265M795079; Blue, Light Blue pattern/Black, Blue leather; Estimate $1,434,120 – $1,792,650; Unrestored original, 2+ condition; With Reserve; Hammered Sold at $1,822,528 plus commission of 12.83%; Final Price $2,056,319. – Carbon brakes. – 840km and like new. ‘Transformers’ themed livery with unknown early history traceable to Silicon Valley the year it was built. It’s reasonable to infer it was bought by some newly enriched game programmer although the theme today is dated. – Dated, but not outdated if this handsome price is any indication. It isn’t crazy money, and it might even be moderate if it is considered “art” and not “car”. 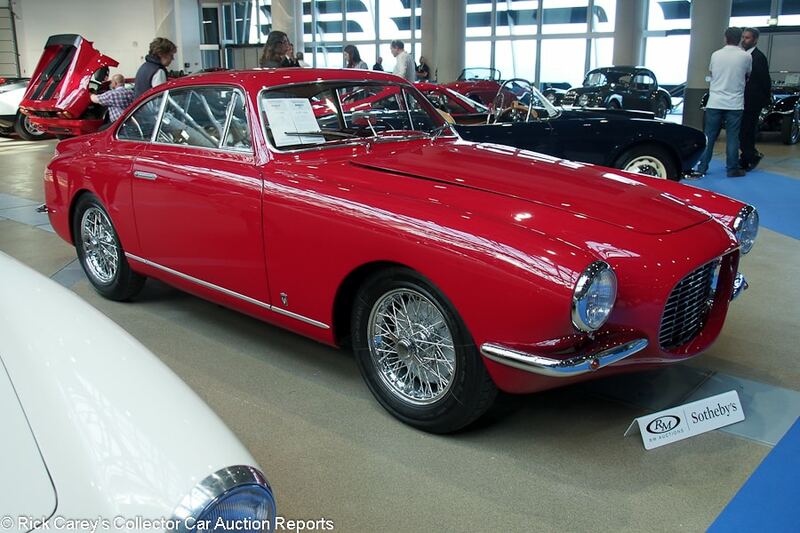 Lot # 152 1954 Fiat 8V Coupe, Body by Vignale; S/N 106000047; Engine # 000090; Red/Beige leather; Estimate $896,325 – $1,135,345; Older restoration, 2- condition; With Reserve; Not sold at Hammer bid of $740,962. – Chrome spoke Borrani wire wheels, Michelin tires, Marchal headlights. – Restored in 1990 by Mike Fennel for Don Williams, still with very good paint and chrome. The upholstery is lightly stretched and surface creased. The chassis and engine compartment are older than the paint which was originally green. The left door window is scratched. Represented as the original engine, and pleasingly presented with a solid old restoration showing its quality in its now nearly 30 year old preservation. – Make it green again and this would be a spectacular Fiat, maybe even spectacular enough to bring it the pre-sale estimate range. As it is in Red/Beige it is pedestrian, a quality shown by its desultory reception by the Monaco bidders. 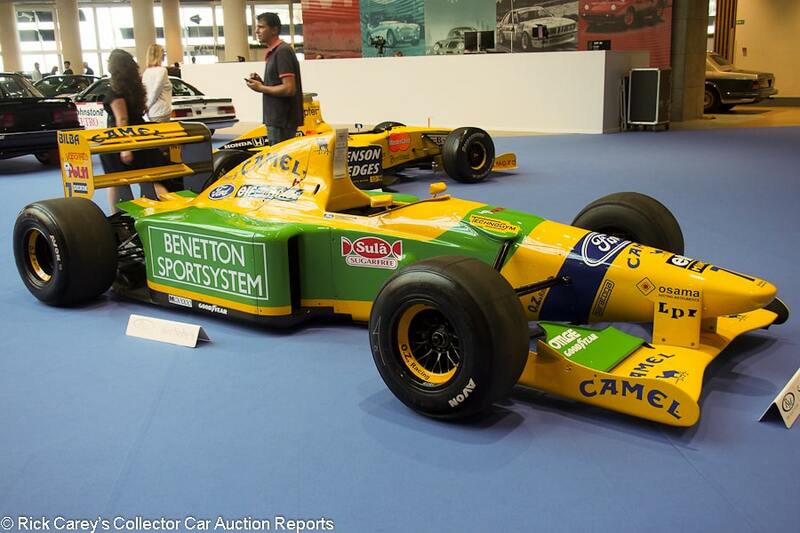 Lot # 153 1992 Benetton B192 Formula 1; S/N B19201; Yellow, Green ‘Camel’/Black; Estimate $657,305 – $896,325; Competition restoration, 2 condition; No Reserve; Hammered Sold at $860,472 plus commission of 13.19%; Final Price $974,007. – Avon tires, O.Z. wheels, Ford HB V-8. – Michael Schumacher’s 1992 Spanish GP 2nd place finisher in his first full season in F1, no subsequent period racing history. Neat and orderly, professionally prepared and race-ready. Authenticity certificate by the Benetton team. – We remember several things with this F1 car: Michael Schumacher’s virtuosity; the emergence of Ross Brawn as one of F1’s eminences; and the bloom and fading of the United Colors of Benetton, a brand that has been eclipsed after only a few years in the spotlight. [A supporting sponsor was “Osama Writing Instruments”, probably not a brand in much favor after 2001.] Aside from the Schumi connection this is a pretty ordinary but beautifully presented Ford-powered ’92 F1 car but the Schumi connection and dramatic Camel/Benetton livery make a statement and brought a superior price. 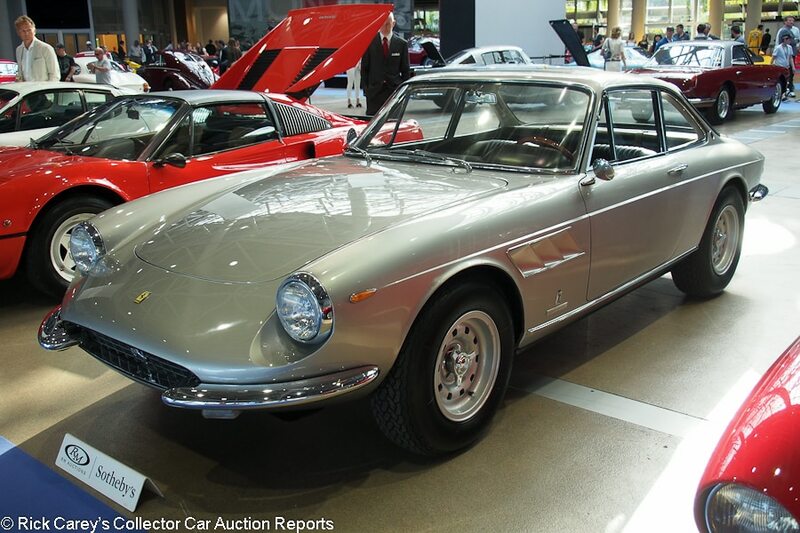 Lot # 154 1967 Ferrari 330 GTC Coupe, Body by Pininfarina; S/N 11087; Engine # 11087; Silver-Grey/Black leather; Estimate $507,918 – $567,673; Visually maintained, largely original, 3- condition; With Reserve; Hammered Sold at $501,942 plus commission of 13.69%; Final Price $570,660. – Centerlock alloy wheels, Michelin XWX tires, Voxson 8-track stereo, power windows, air conditioning. – Good older paint and fresh interior. Thin chrome. Steering wheel varnish is peeling off the aluminum. The underbody is old and has some rusted margins. Ferrari Classiche certified but aging. – Reported offered in 2000-01 in FML with 105,000 km and now showing 9,665 km, this GTC was reported sold at the Sportscar auction in Switzerland in 1991 for $149,898, SFr 219,600 at the time. It is in less than encouraging condition and brought a less than encouraging price consistent with its condition here. 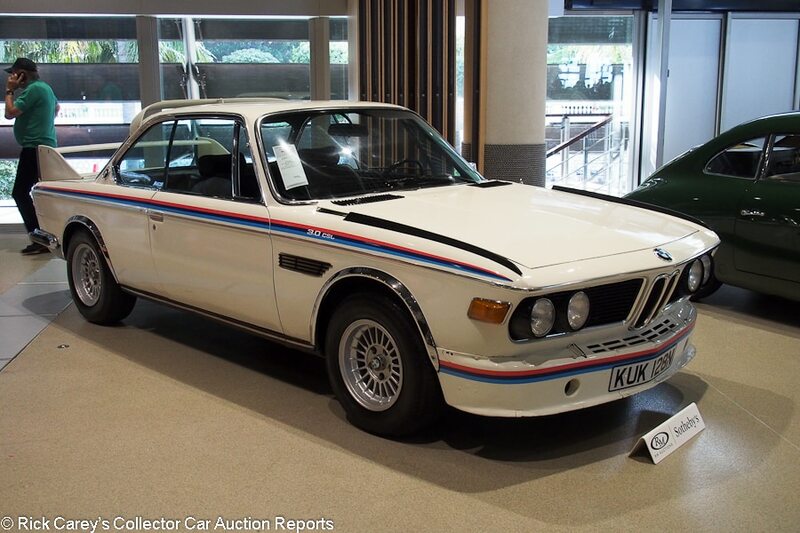 Lot # 155 1975 BMW 3.0 CSL Coupe ‘Batmobile’; S/N 2275501; Engine # 2275501; White, Red, Blue accent/Black vinyl, Red cloth inserts; Estimate $346,579 – $466,089; Visually maintained, largely original, 4+ condition; With Reserve; Not sold at Hammer bid of $310,726. – Phillips cassette stereo, Alpina alloy wheels, Vredestein tires, Scheel headrest seats, halogen headlights, air dam, wing, roof deflector. – Represented as 39,093 km from new. Blistered, scratched old repaint over old paint. Tape graphics. Cracked air dam. Scuffed windshield. Worn, stretched original upholstery, Thin trim chrome, blistered roof deflector. Grungy original underbody. A desirable automobile but not a desirable example. The represented 39,093 km is not believable based on its battered condition. Even 139,093 km (86K miles) is hard to accept for its condition and 239,093 km (148.5K miles) seems more realistic. – The catalog describes this CSL’s condition as “overwhelmingly original”, which is accurate, but perhaps not in the way the cataloger intended. It’s beat up, used and by any standard pretty overwhelmingly whipped and battered. It could have been cut loose and sold well before this bid with no second thoughts at all. 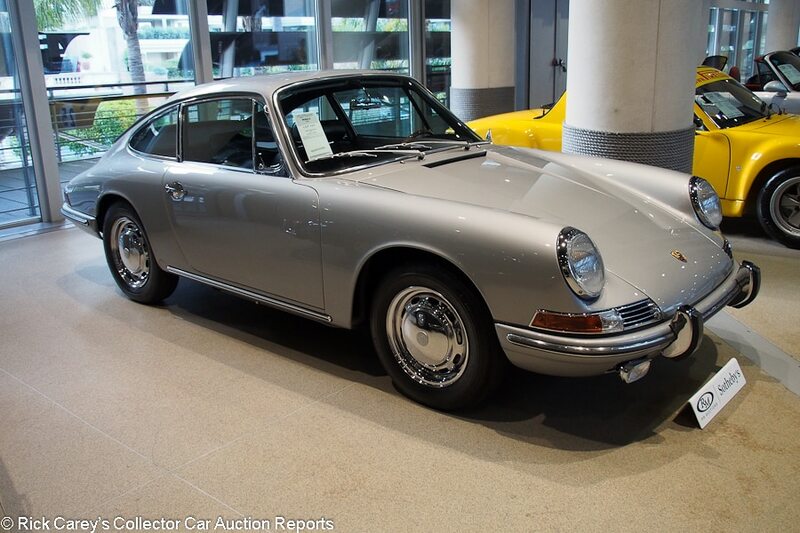 Lot # 157 1965 Porsche 911 Coupe; S/N 300835; Engine # 900965; Silver-Grey/Black vinyl; Estimate $328,653 – $388,408; Recent restoration, 2+ condition; With Reserve; Hammered Sold at $310,726 plus commission of 14.42%; Final Price $355,542. – Chrome wheels, hubcaps, Michelin tires, Porsche woodrim steering wheel, Blaupunkt multiband radio, headrest seats, Solex carbs. – Excellent paint, chrome and interior. Like new engine, underbody and luggage compartment. Restored to high standards from a fairly rotten California car and pleasing to look at. – The seller/restorer of this Porsche was appropriately proud of the Old World (Balkan) craftsmanship that resulted in its impeccable appearance here. He claimed “no filler”, a claim confirmed by the paint thickness gauge’s reading that never got higher than 0.4mm. 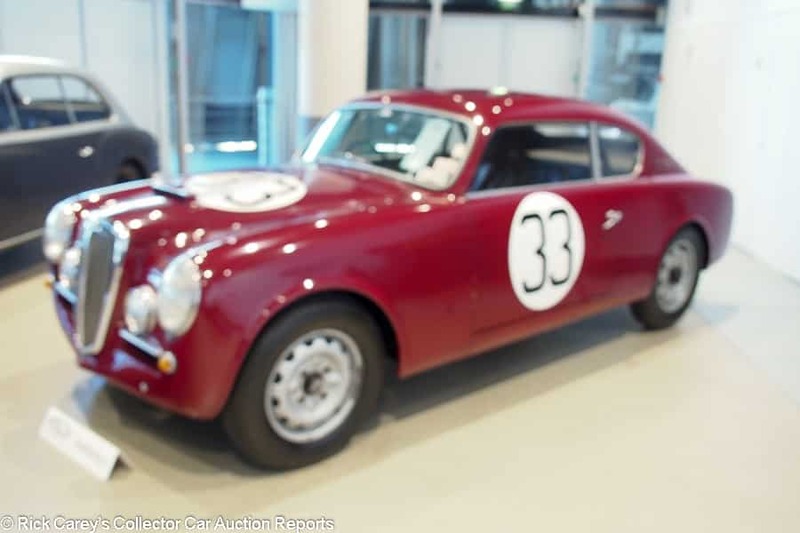 The bidders must have been similarly impressed, putting a princely price on the Porsche. 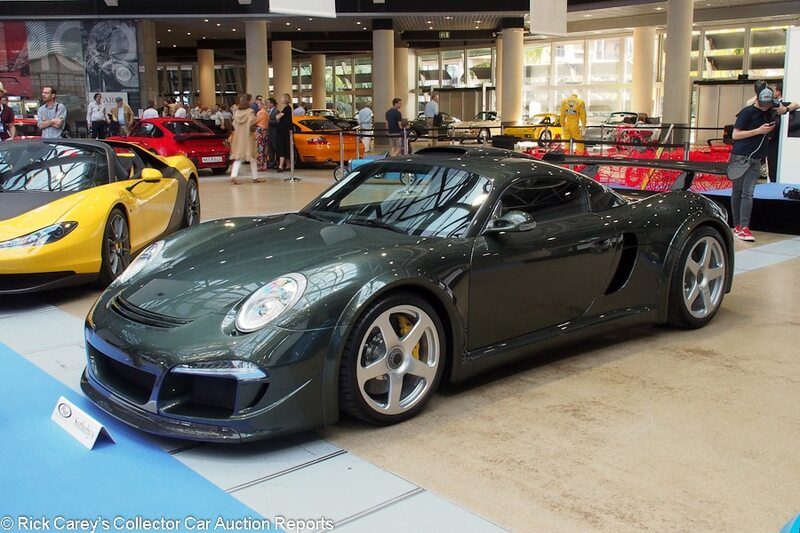 Lot # 159 2018 RUF CTR3 Clubsport Coupe; S/N W09BM0388JPR06022; Engine # CTR338021C; Oak Green Metallic/Black leather, plaid cloth; Estimate $956,080 – $1,075,590; Unrestored original, 2+ condition; With Reserve; Hammered Sold at $1,171,198 plus commission of 13.01%; Final Price $1,323,573. – 3.8 liter/777hp twin turbo Porsche-based ending, 7-speed sequential dual clutch gearbox, Yellow calipers, carbon fiber splitter, wing and diffuser, centerlock 19- and 20-inch wheels, Michelin tires. – Mid-engined Porsche-based car built for RUF by Multimatic in Canada. One of seven CTR3 Clubsports. Unblemished and like new. – The EU considers this a new car and will extract 20% VAT on the purchase price and commission bringing the ultimate ticket here to a scosch under $1.6 million if it isn’t exported to the Middle East, Russia or North America. That is a generous result compared with some alternative supercars. 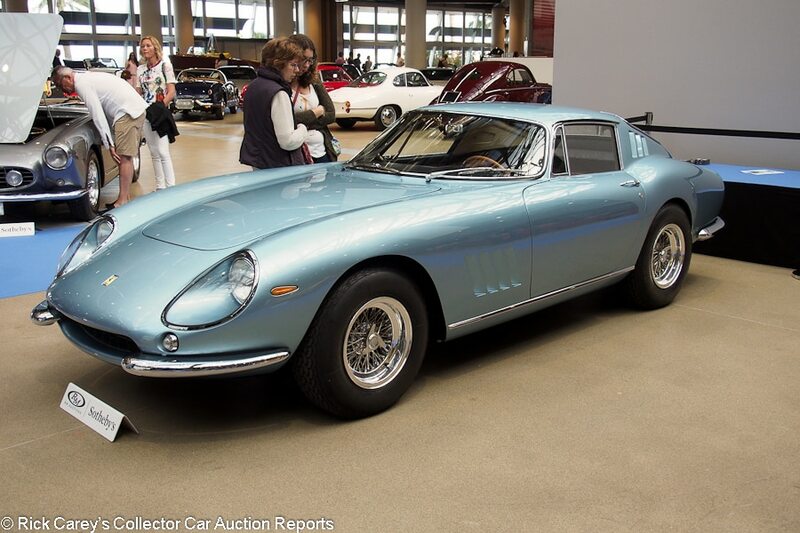 Lot # 160 1966 Ferrari 275 GTB Berlinetta, Body by Pininfarina-Scaglietti; S/N 08729; Engine # 06729; Blue Metallizato/Beige leather; Estimate $2,390,200 – $2,629,220; Cosmetic restoration, 2- condition; With Reserve; Hammered Sold at $2,270,690 plus commission of 12.76%; Final Price $2,560,502. – Chrome spoke Borrani wire wheels, Michelin XWX tires. – Long nose, torque tube, steel body. Exceptional paint, chrome and interior. Ferrari Classiche certified. The engine compartment is good but shows some age and isn’t as good as the 2007-8 Bob Smith cosmetics. The engine block is Classiche stamped. – Offered by Gooding at Scottsdale in 2014 where it was bid to $1,650,000, it found a receptive audience here in Monaco willing to accept the mediocre cosmetic presentation under the hood and on the chassis while valuing the exceptional cosmetics on the outside and in the cockpit. It is a realistic price for both the buyer and the seller. 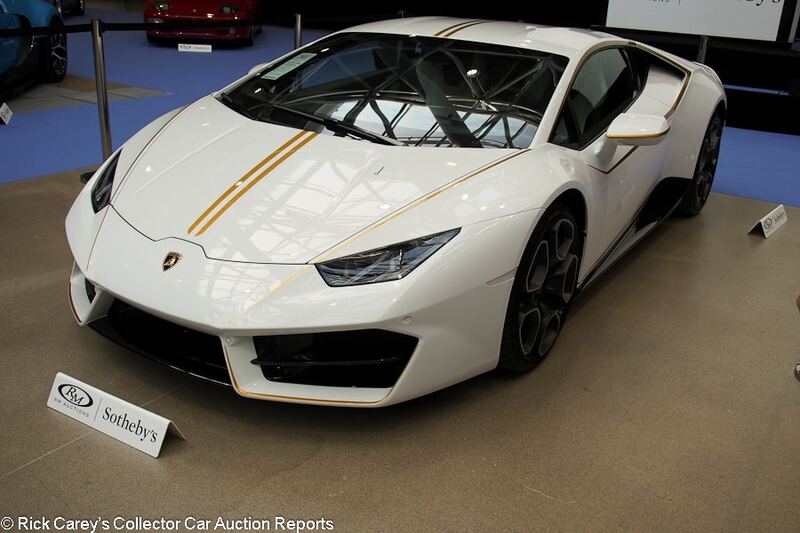 Lot # 161 2018 Lamborghini Huracan RWD Coupe; S/N ZHWEC2ZF1HLA06894; White, Yellow, Gold accents/Black, White; Estimate $298,775 – $418,285; Unrestored original, 2 condition; No Reserve; Hammered Sold at $854,497 plus commission of 13.20%; Final Price $967,284. – Black alloy wheels. – Built specifically for Pope Francis, signed on the hood. All proceeds to Papal charities with 70% designated for the city of Nineveh, Iraq. A new car with delivery miles. – 20% VAT due on the purchase price and commission. 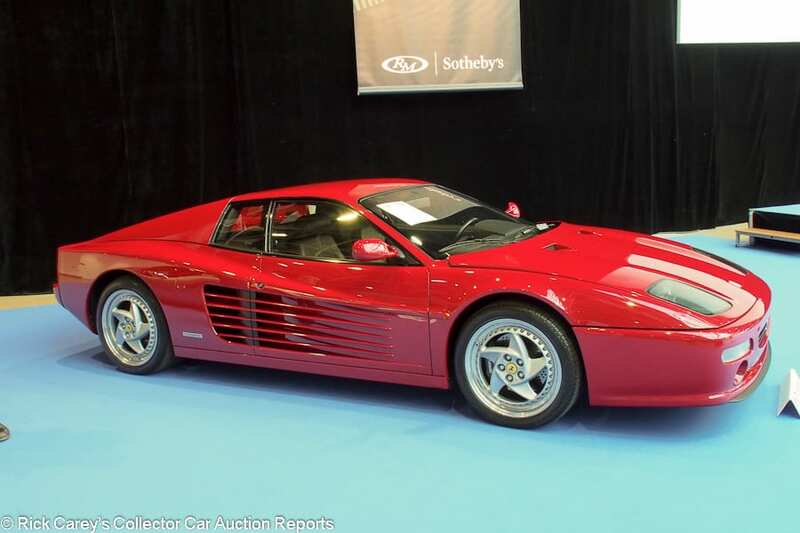 This was the day’s most outstanding bidding contest between a bidder in the room and one on the phone steadily pushing the price into the Lamborghini stratosphere. Eventually bought by a Spanish luxury car rental company, Rent Car Deluxe, which will rent it to clients again with all rental proceeds going to charity, in this case disadvantaged children. There is a lot of generosity among the car collecting community and the result here is all about helping those in need and only a little about the underlying value of the Huracan, a $200,000 MSRP car. 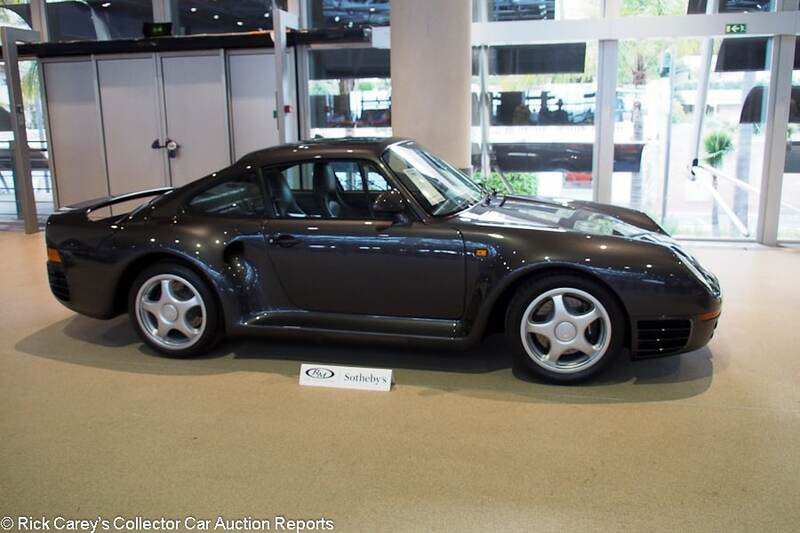 Lot # 164 1987 Porsche 959 Komfort Coupe; S/N WP0ZZZ95ZHS900083; Anthracite Grey Metallic/Black, Gray leather; Estimate $938,154 – $1,135,345; Unrestored original, 2- condition; With Reserve; Hammered Sold at $884,374 plus commission of 13.18%; Final Price $1,000,896. – Air conditioning, factory stereo with navigation, power seats, power windows. – Lightly stretched upholstery. The original paint has a few tiny stone chips. Essentially like new despite showing 49,411 believable kilometers. – Still one of the most amazing automobiles ever built, a technical triumph that presaged the Supercar and Hypercar eras, showing just what could be done. This result is realistic for this 959 Komfort’s presentation and preservation but arguably undervalues its milestone stature. 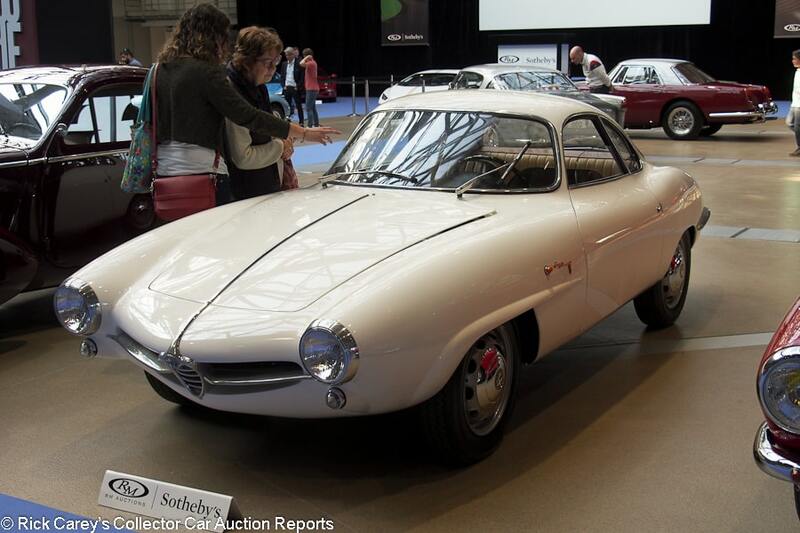 Lot # 166 1959 Alfa Romeo Giulietta Sprint Speciale ‘Muso Basso’; S/N AR1012000068; White/Tan, Beige vinyl; Estimate $418,285 – $537,795; Recent restoration, 2- condition; With Reserve; Hammered Sold at $406,334 plus commission of 13.97%; Final Price $463,101. – Silver steel wheels, hubcaps, Vredestein tires. – Early “low nose” body style. Missing panel under the dashboard. Excellent fresh paint and interior. The underbody is done like new but the engine is inaccessible. Scratched windshield. Scuffed headlight bezels and grille bar. Represented as the original engine, gearbox and rear axle, restoration completed just before the auction, but curiously unsatisfying. – Even for the low nose early body style (101 built) and month-old restoration this is a generous price that puts great faith in the restoration’s quality with little time to test it out as evidenced by the five miles on the odometer. There are too many little oversights to instill much confidence in it but the bidders didn’t seem to care. As it sits, it is expensive. Lot # 167 1957 Ferrari 250 GT TdF Berlinetta Competizione; S/N 0879GT; Engine # 0879GT; Dark Red, Black stripe/Tan leather; Estimate $8,365,701 – $10,755,901; Visually maintained, largely original, 3- condition; With Reserve; Not sold at Hammer bid of $7,409,621. – Chrome spoke, Borrani wire wheels, Pirelli tires, sliding Plexiglas side windows, covered Marchal halogen headlights, Marchal driving lights, 3-vent c-pillar, cold air box. – Raced when new by Wolfgang Seidel, 2nd at Spa and 4th at Reims in 1958 among many other events. Fairly awful quick repaint over old paint on an assembled car. Painted over old chips. Dented right door. Good new upholstery. Good gauges. Old underbody and older chassis. Restored engine sitting in an orderly but unrestored engine compartment. Represented as the original engine, gearbox and rear axle, Ferrari Classiche certified. – Both the pre-sale estimate and the reported high bid are representative of the presentation of this otherwise highly desirable early Tour de France with its creditable early racing history. 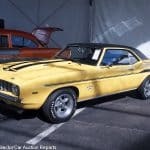 It will be a great car for the many prestigious events for which it is eligible even in its present condition but is eventually destined for a restoration shop and a straightforward but expensive comprehensive redo. It would be a sound value at or at least closer to the low estimate but the reported result here is skewed by a fairly strong dollar this week. 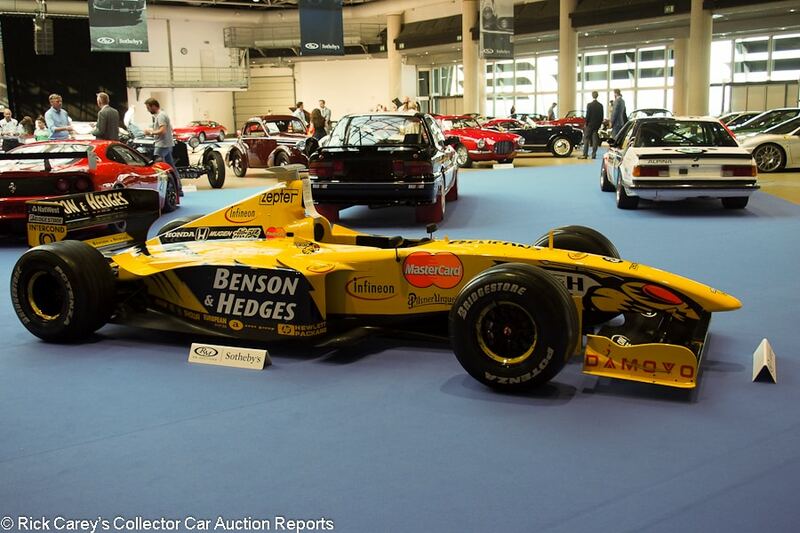 Lot # 168 1999 Jordan 199 Formula 1; S/N 003; Yellow, Black, ‘Benson & Hedges’/Black carbon fiber; Estimate $298,775 – $418,285; Competition restoration, 2- condition; With Reserve; Hammered Sold at $250,971 plus commission of 14.88%; Final Price $288,318. – Bridgestone tires, O.Z. wheels, Mugen-Honda engine but missing the gearbox guts, exhaust manifolds, steering wheel and steering box. – Raced by Heinz-Harald Frentzen in 1999, second in Australia and third in Brazil then retired to spare car status. Very good paint. Orderly chassis showing some age. Appears to be race-ready, apart from the missing pieces. 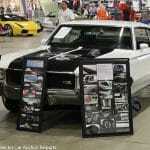 – This is almost $300 Large for what is in effect a display car, an expensive piece of garage art. 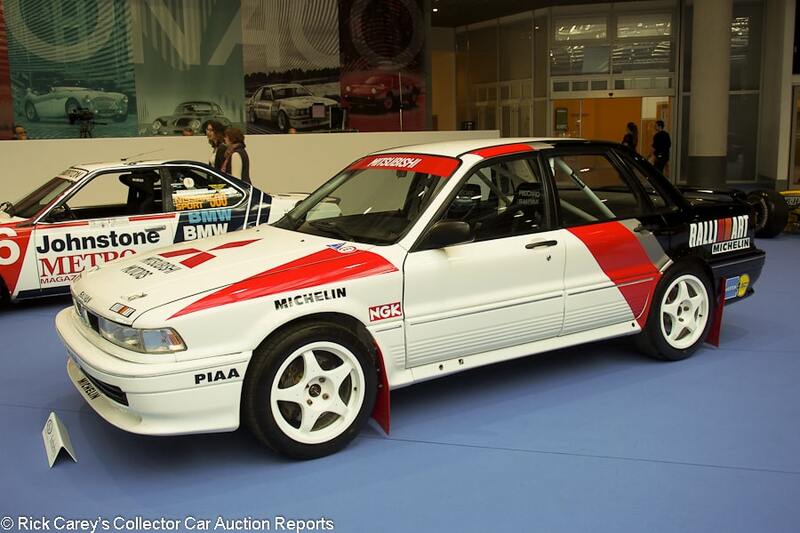 Lot # 171 1990 Mitsubishi Galant VR-4 4-Dr. Sedan Rally Group A; S/N JMBSNE11Y70441; White, Red, Black/Black cloth; Estimate $107,559 – $155,363; Competition restoration, 3+ condition; With Reserve; Not sold at Hammer bid of $95,608.– 1992-dated Recaro seats, 5-point Schroth belts, roll cage, 5-spoke white alloy wheels, AP disc brakes, all-wheel drive, four-wheel steering. – Built locally in Ivory Coast, winner of the 1990 WRC Rallye Cote d’Ivoire Bandama with local team of Patrick Tauziac and Claude Papin then left in Africa. Vinyl graphics, carbon fiber interior panels. Sound older paint and seats. Age showing in the wheel wells. – A somewhat obscure but successful car that didn’t get bids sufficient for the consignor to let it go. Lot # 173 1957 Ferrari 250 GT Boano Coupe, Body by Boano; S/N 0639GT; Engine # 0639 GT; Silver-Grey, Silver roof/Natural leather; Estimate $956,080 – $1,195,100; Older restoration, 3+ condition; With Reserve; Hammered Sold at $896,325 plus commission of 13.17%; Final Price $1,014,341. – Chrome spoke Borrani wire wheels, 6.00 -16 Michelin Pilote Course tires, Marchal headlights and fog lights, SF shields, low roof Boano body. – Paint blisters on the driver’s door and a chip on the sill. Otherwise very good paint, chrome and interior from a 2012 cosmetic refresh. The engine, reportedly rebuilt in December 2017 by Terry Hoyle, is much more fresh than the hole it sits in which has a casual old repaint over even older paint. Ferrari Classiche certified. – Offered by Poulain-Sotheby’s in December 2000 and reported bid to $111,895, then here in Monaco by the same house where it sold for $119,460 and had a claimed 68,580km from new (the odometer today shows 78,385km.) Generously bid here for its condition, particularly in €which are currently soft against the dollar, the rather erratic condition does this Boano no favors. 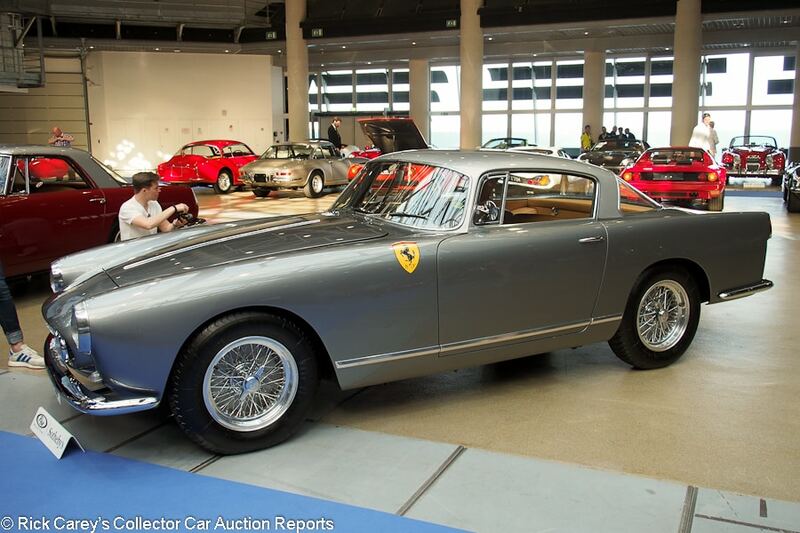 Lot # 176 1957 Ferrari 250 GT Coupe, Body by Pinin Farina; S/N 1555GT; Burgundy, Silver roof/Tan leather; Estimate $573,648 – $693,158; Recent restoration, 2 condition; With Reserve; Not sold at Hammer bid of $549,746. – Chrome spoke, Borrani wire wheels, Pirelli tires, factory disc brakes. – Wiper scratched windshield. Excellent paint, chrome, interior and body fits. The underbody and engine compartment are like new, even to oil seepage from the cam covers. Ferrari Classiche block and certification. Like new except for the faintest stretch on the driver’s seat and the replacement cylinder block. 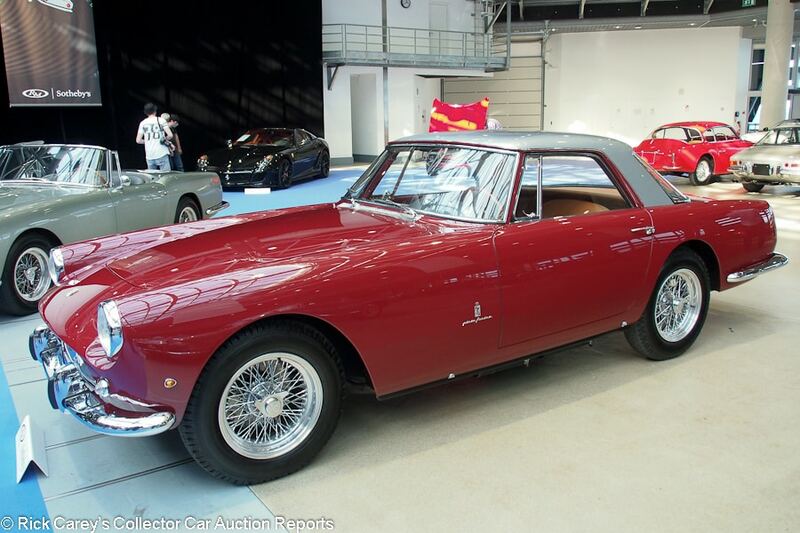 – This is an impressive 250 GT Pf Coupe, but it was bid to an appropriately impressive price only 10,000 €below the low estimate, a perfectly reasonable offer even in today’s strong U.S. $. Lot # 179 1934 Lancia Augusta Coupe; S/N 342032; Violet sides, Silver/Grey broadcloth; Estimate $47,804 – $71,706; Visually maintained, largely original, 4+ condition; No Reserve; Hammered Sold at $33,463 plus commission of 15.00%; Final Price $38,482. – RHD.1,196cc/35hp V4, 4-speed, Black wire wheels, Michelin tires, trafficators, fog lights. – Damaged during WWII and rebodied thereafter for Count Carlo Bruzzo of Genoa. Quick, flawed repaint. Numerous flaws including cracks at the base of both windshield posts. Grungy chassis, several bent wheel spokes. Nearly every window was scratched by the galoot who sanded the body with the glass in place. An intriguing car but a daunting project with a checkered history. 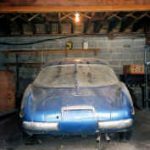 – It’s a car that needs plenty of work before it is going to be driven with even a modicum of pride and confidence and the seller should be very pleased to get this much for it. Lot # 180 2012 RUF Rt 35 Anniversary Coupe; S/N W09BB0386CPR06156; Yellow/Black leather; Estimate $298,775 – $358,530; Unrestored original, 2 condition; With Reserve; Not sold at Hammer bid of $262,922. – 3.8/630hp, Yellow calipers, 7-speed paddle shift, rear wheel drive – Represented as 26,400 km from new and like new except for light scuffing on the driver’s seat back bolster. One owner from new. Sold on a bill of sale. Number two of 35 built. – Highly respected and recognized in Germany as a manufacturer, this Ruf Rt 35 Anniversary recalls the original “Yellow Bird” that made Alois Ruf’s name as a supercar manufacturer. The offer for it here is reasonable, but apparently not reasonable enough for the seller. 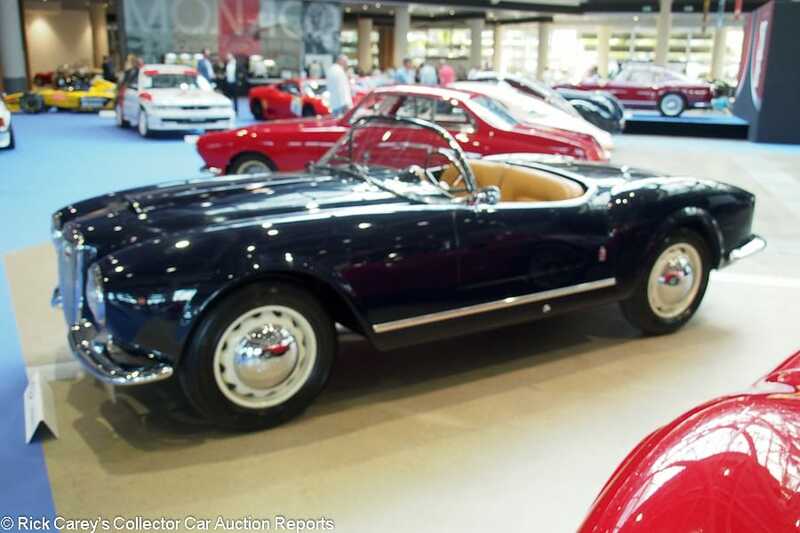 Lot # 181 1955 Lancia Aurelia B24S Spider America, Body by Pinin Farina; S/N B24S1149; Amaranth/Biscuit leather; Black cloth top; Estimate $956,080 – $1,195,100; Cosmetic restoration, 3+ condition; With Reserve; Not sold at Hammer bid of $812,668. – Cream wheels, Michelin tires, Carello headlights, floor shift. – Scuffed old paint with a field of blisters on the deck lid. Good older interior with light creases. Sound chrome. Old undercoat with light exterior overspray. Crazed steering wheel center but very good wood rim. A sound and usable older cosmetic restoration with visible flaws that need attention. – Highly coveted for many reasons including rarity, design and performance, if there’s one Lancia to have it’s the B24S Spider America. 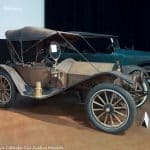 This one appears to be sound but it is definitely aged and was on static display in the Gnutti Collection for many years. Its long dormancy suggests the new owner will have to face some recommissioning issues but the parsimonious bid it brought here is unreasonably low even taking that and the tired paint into account. 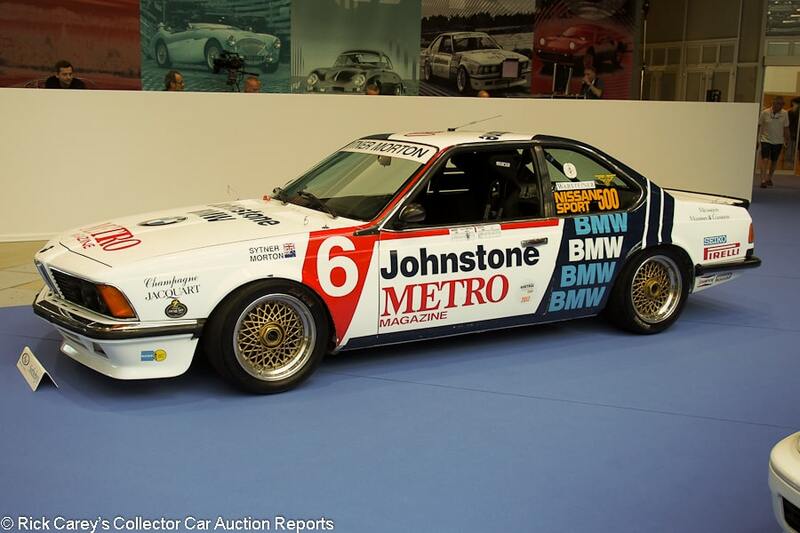 Lot # 183 1983 BMW 635 CSi Coupe Group A; S/N RA122; White, Blue, Red/Black cloth; Estimate $358,530 – $418,285; Competition restoration, 3+ condition; With Reserve; Hammered Sold at $310,726 plus commission of 14.42%; Final Price $355,542. – Motec display, gold center modular centerlock wheels, Avon tires, Sparco seat and belts. – Built by Ted Grace International for Frank Sytner, raced in the BTCC/ETCC in 1983-84 then raced in New Zealand. Decent paint, black painted gutted interior. Miles evident inside the wheel wells. Last raced a year ago at Jarama according to the scrutineering sticker on the door. – This is a real race car with serious performance, safety and a creditable history when new. It is a sound value at this price and stands to be a front-runner at historic events. 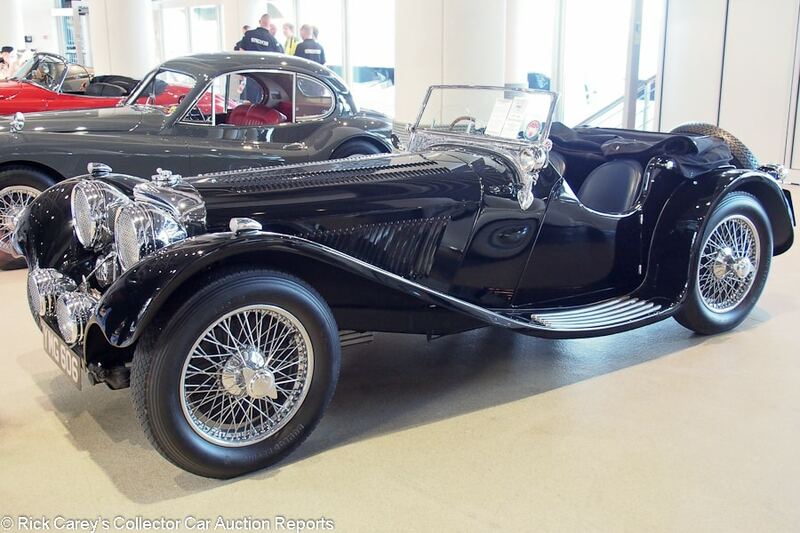 Lot # 184 1937 SS Jaguar 100 2 1/2 Liter Roadster; S/N 18116; Black/Blue leather; Black cloth top; Estimate $298,775 – $358,530; Cosmetic restoration, 3+ condition; No Reserve; Hammered Sold at $256,947 plus commission of 14.83%; Final Price $295,040. – RHD. Chrome wire wheels, Dunlop tires, dual rear-mounted spares, folding windshield, dual aeroscreens, Lucas headlights, driving and fog lights, light and radiator stoneguards. – U.S. history since 1955, never fully restored but given a good cosmetic restoration some time ago and by all appearances regularly maintained. Orange peely repaint, good upholstery, top and chrome. Orderly engine compartment done to touring standards. Replacement engine. – Sold by RM at Villa Erba five years ago in 2013 for $361,760 (€280,000 at the time), then offered by RM two months ago at Amelia Island where it was reported bid to $340,000 (€275,800 at the time.) It was time to go away here in Monaco, and did at a result that is seriously advantageous for the new owner, even with the replacement engine. It is the 3.5 liter SS100 that gets the most attention and much bigger money but the 2.5 Liter has the same exquisite style only 14 fewer horses and performance more than adequate to keep up with traffic. A good value. Lot # 186 1995 Ferrari F512 M Berlinetta; S/N ZFFVA40JPN0103477; Engine # 40937; Rosso Barchetta/Black leather; Estimate $358,530 – $418,285; Unrestored original, 2 condition; With Reserve; Not sold at Hammer bid of $304,751. – Rotation specific modular 5-spoke alloy wheels, PZero tires, air conditioning, car cover, flashlight, manuals. Assembly #20587. – Pristine and original with a reported 4,042 km from new with all its original tags and protective covers. Delivered new in Japan, recent Euro 20,000 service, Ferrari Classiche certified. – Reported sold by RM in London two years ago in September 2016 for $313,733 (€279,200 at the time) and now showing just 77 more kilometers on its odometer than it did then, the haircut must have been more than the consignor could accept. Waiting for more, however, may be futile in today’s largely static market. The auction history is confused by the catalog’s statement that the present owner bought it from Japan in 2013, which contradicts the reported 2016 sale in London. 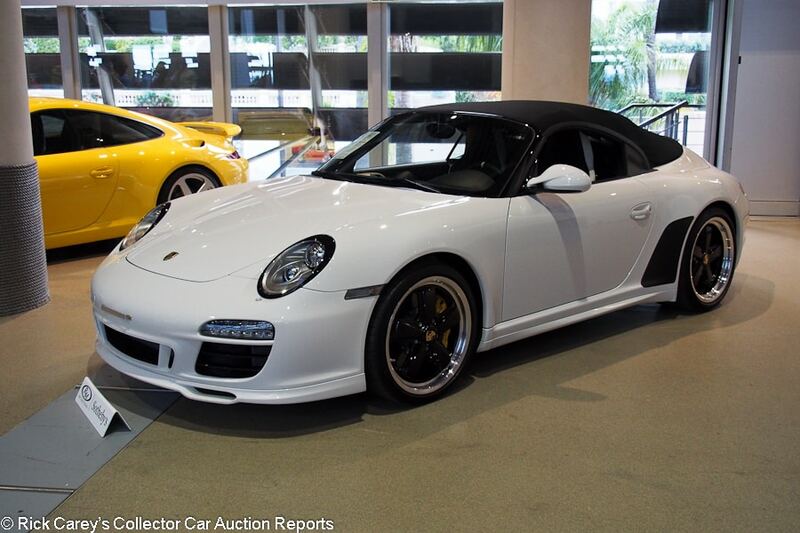 Lot # 191 2011 Porsche 911 Speedster; S/N WP0ZZZ99ZBS795209; Carrera White/Black, White leather; Black cloth top; Estimate $215,118 – $262,922; Unrestored original, 2 condition; No Reserve; Hammered Sold at $256,947 plus commission of 14.83%; Final Price $295,040. – Black center Fuchs wheels, Michelin tires, factory stereo with navigation, Yellow calipers. – 4,500 kilometers and looks like less. – Porsche’s decision to call this humped rear deck colossus a “Speedster” subverts the term. In profile it is a seriously unbalanced form and even an exposed top Porsche cabriolet is far more attractive. The bidders in Monaco didn’t seem to care and paid a generous, but not irrational, price for this example’s low mileage and preservation. 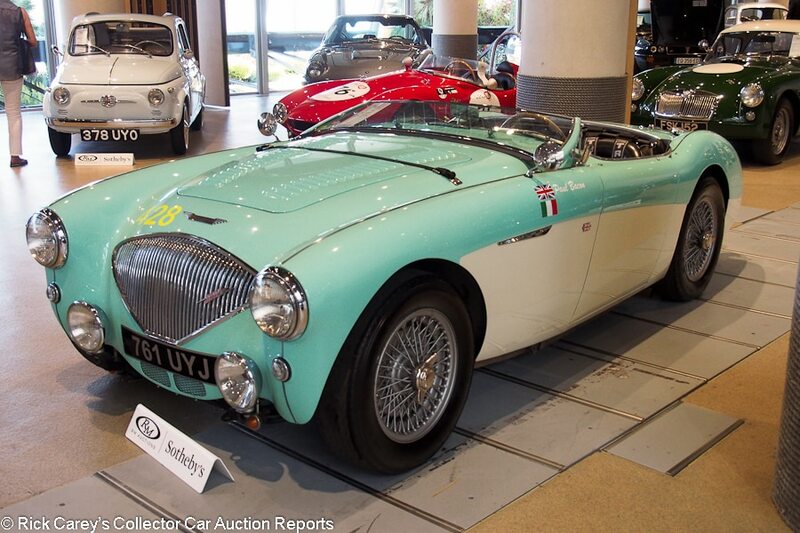 Lot # 192 1956 Austin-Healey 100/M Le Mans Roadster; S/N BN2L233047; Engine # 18233047M; Florida Green, Ivory/Black leather; Black leatherette top; Estimate $203,167 – $227,069; Cosmetic restoration, 3+ condition; With Reserve; Not sold at Hammer bid of $173,290. – Moto-Lita woodrim steering wheel, replacement tach, Monit electronic rally odometer, Silver painted wire wheels, Avon tires, halogen headlights, Lucas driving light and fog light, Lucas fog light reversing lamp, overdrive 4-speed. – Good older repaint and upholstery. The chassis old, road grimy and has some exterior overspray. Peeling windshield post chrome. 2015 Mille Miglia participant, BMIHT and 100/M registry documented. A charming but inconsistent car. – The bid here may have been well under the pre-sale low estimate but it is appropriate to this car’s condition and presentation. 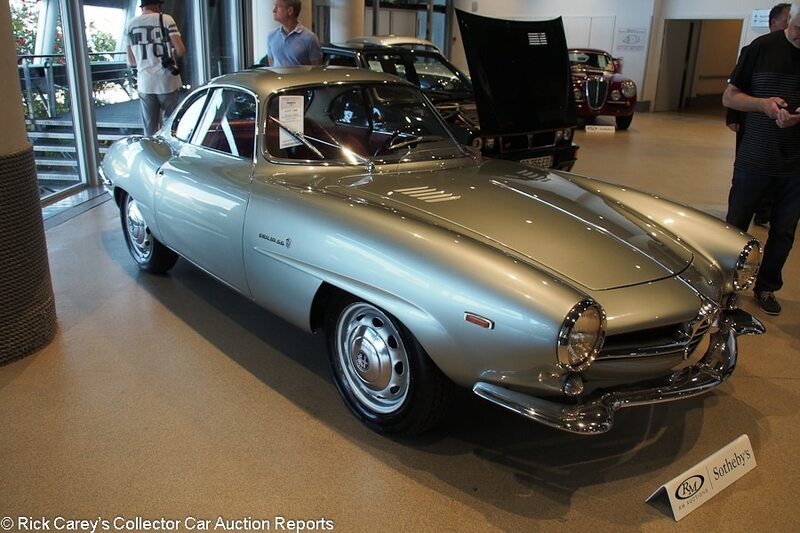 Lot # 198 1965 Alfa Romeo Giulia Sprint Speciale, Body by Bertone; S/N AR381248; Engine # AR011201291; Silver/Dark Red cloth; Estimate $119,510 – $143,412; Cosmetic restoration, 3+ condition; With Reserve; Hammered Sold at $107,559 plus commission of 15.00%; Final Price $123,693. – Silver steel wheels, hubcaps, Vredestein tires. – Good new paint and interior, scuffed chrome. Wheels haven’t been redone and have chipped edges. The engine compartment is orderly but only superficially done. A pretty but ultimately superficial car. – The Monaco bidders cottoned on to the oversights in this Sprint Speciale’s presentation and looked past the fresh paint and fuzzy interior to recognize its numerous shortcomings with this entirely appropriate price. It is a gorgeous driver, but leaves lots to be desired. 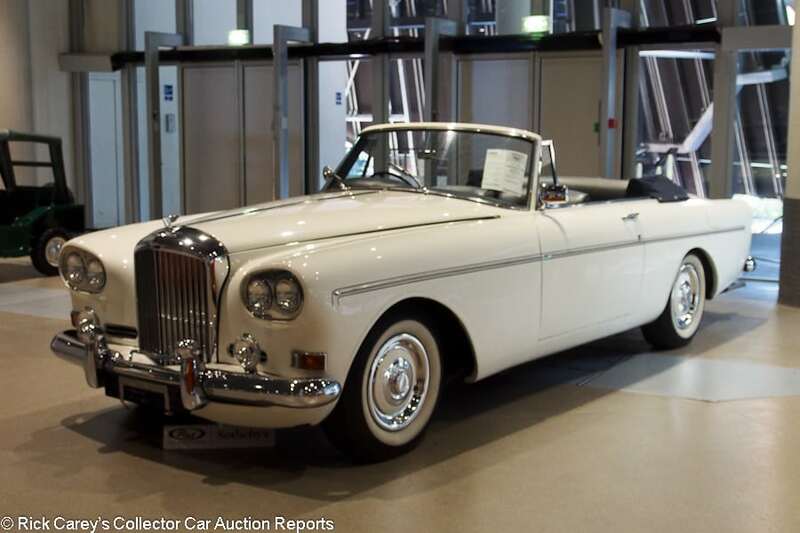 Lot # 200 1964 Bentley S3 Continental Drophead Coupe, Body by Mulliner Park Ward; S/N BC142XC; Engine # 71CBC; White/Grey leather; Blue cloth top; Estimate $71,706 – $107,559; Visually maintained, largely original, 4 condition; No Reserve; Hammered Sold at $149,388 plus commission of 15.00%; Final Price $171,796. – Automatic, Pioneer CD stereo, power windows, Lucas driving lights. 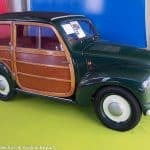 – Cracked original upholstery, chipped steering wheel hub, good interior wood. Expedient old repaint with some masking misses and nearly universal sanding on the window trim. Grungy original engine compartment. Dirty whitewalls. A seriously unattractive Bentley. – Sold by RM in London last September for $75,963 (€63,600 at the time) and sold here for a seriously magnanimous price (€143,800) for a seriously compromised Bentley. The buyer will be remorseful in the morning and $100 Large out of pocket. 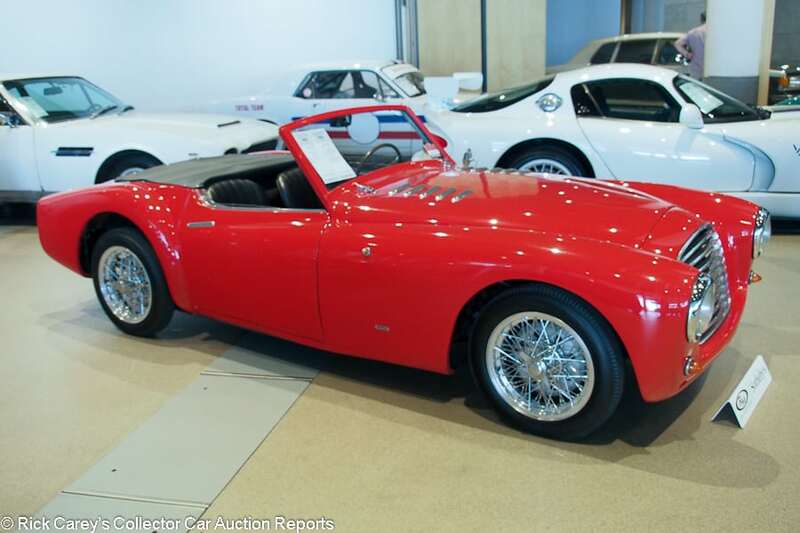 Lot # 201 1949 Fiat-Gilco 1100 Roadster, Body by Zagato; S/N 0010351; Engine # 500027; Red/Black leather; No top; Estimate $239,020 – $298,775; Cosmetic restoration, 3+ condition; With Reserve; Not sold at Hammer bid of $113,535. – Chrome spoke wire wheels, Excelsior tires, rollup windows, 4-spoke woodrim steering wheel. – Good repaint but with a blister and a blemish at the left front corner of the hood. Panel fits are good. Good upholstery and door cards but no carpets or other interior trim. Repainted but not restored engine compartment and chassis. Big crack on a filled crease on the driver’s door. – An attractive little car but with a sketchy history and with a fresh but superficial cosmetic restoration that isn’t reassuring, interest was scant, as the bidding shows, at the end of the auction. 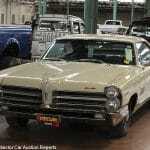 The consignor would favor the car with more searching research and history. The car has appeal, but its history is wanting and fakes from this era abound.